Musings 'n scribblings of a philanthrope .. : How to avoid Alzheimer's. 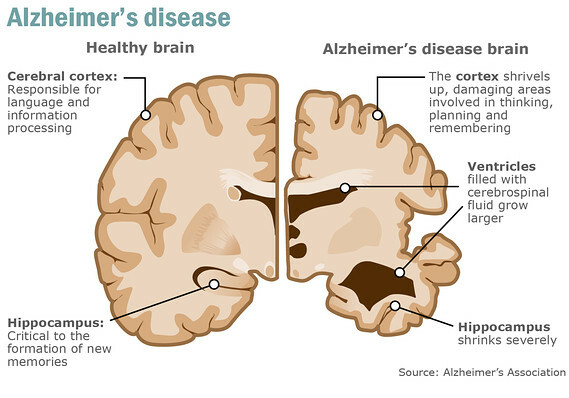 Contrasting a healthy brain and an Alzheimer Diseased (AD) brain. Brain cell connections and the cells themselves degenerate and die, eventually destroying memory and other important mental functions. No cure exists, but medication and management strategies may temporarily improve symptoms. How can one take precautions to prevent onset of AD..
Alzheimer's disease is a great monster, but it is not hard to do the proposed exercises and prevent it. Alzheimer's can be prevented, by new technique to improve concentration, develop creativity and intelligence, by performing these simple exercises of Neurobics. "Neuroscience" reveals that the brain has an extraordinary ability to grow and change the pattern of its connections. The authors of this discovery, Lawrence Katz and Manning Rubin (2000), reveal that Neurobics, or "aerobic neurons" is a new form of brain exercise, designed to keep the brain agile and healthy, creating new and different patterns of behavior, and of the activities of the neurons in your brain. About 80% of our day to day tasks are done on AUTO MODE (i.e. we do them without exercising our brain.) which despite having the advantage of reducing intellectual effort, hide a perverse effect: they limit and atrophy the brain, not allowing the renewal and growth of their neurons. Some of the exercises . Use the watch on the pulse opposite to the one that normally uses it. Brush the teeth with the opposite hand. Walk around the house, backward (in China, this routine is practiced in the parks). Dress with your eyes closed. Stimulate the palate with things of different flavors. See the photos, head down (or the photos, or you). Look at the time, in the mirror. Change the routine path to go and return home.